Thank you to our wonderful readers that participated in our 1 Year Anniversary of Blogging Celebration! What a ride these past 5 weeks have been! We’ve really enjoyed learning why you chose Montessori, hearing about your challenges, and re-visiting our favourite posts with you. We wish we could have offered a giveaway to all of you as you each give us so much joy and encouragement with your feedback, comments, and questions. Keep it coming!!! We’d love to see more engagement on the blog in our second year of blogging as we love hearing from you! So go check them out if you’re new to the blog! We also want to say congratulations again to all our winners! Congratulations to Crystal G.. on winning the 5 Pack of Toys from Beginning Montessori! Congratulations to Diara D. on winning the signed copy of The Joyful Child by Susan M. Stephenson (Michael Olaf)! 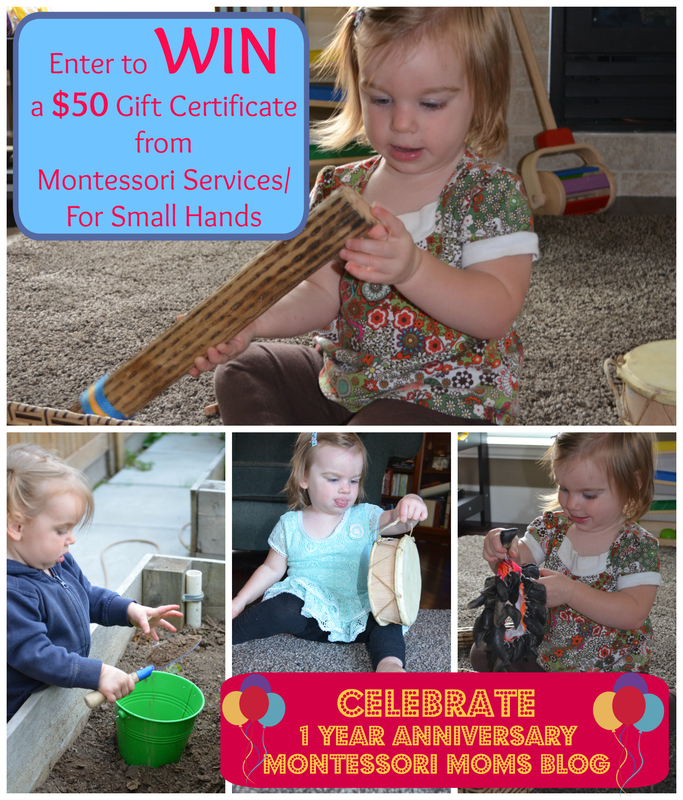 Congratulations to Danielle F. on winning the $50 Gift Certificate to Montessori Services/ For Small Hands! Congratulations to K on winning the Montessori Apron from Handmade Montessori! Congratulations to Jamie on winning the Montessori Placemat from How We Montessori Shop! Congratulations to Kathy D. on winning the Home Consultation from Aid to Life Education! Please go support these wonderful sponsors for our 1 Year Anniversary Celebration!!! We greatly appreciate their support for our blog and their commitment to the Montessori community. We have some exciting posts planned to share with you in the coming weeks, so we hope you’ll stay with us for another year! Happy 1st Anniversary! The Joyful Child Giveaway! Can you believe we’re already on our last week of giveaways as we celebrate our 1st Annivesary?! Last week’s giveaway is still up until 11:59PM PST tonight! It’s your last day to enter for a $50 Gift Certificate to Montessori Services/For Small Hands if you haven’t done so already. We’ve been enjoying sharing with you our favourite products and helping you bring more Montessori into your homes to celebrate. This week, our final week of giveaways, we have two giveaways. Today I’ll announce the first one. We’re offering a signed copy of The Joyful Child by Susan Mayclin Stephenson! Yes, I said signed! Susan was so wonderful to donate a signed copy of her book at my request. She has such a passion to further bring Montessori to the youngest children. This is such a wonderful opportunity to learn more about Montessori from birth to three years of age. You may have started reading about Montessori on a blog, perhaps this one, and you’re wondering what might be good book to learn more. Having been published as a formal book only last year, I find it’s not often the suggested Montessori book. After reading it earlier this year, I fell in love with it! Susan writes in such a warm, gentle tone. She weaves jam-packed advice into a simple scenario of how to set-up a space for your child. The advice about how to handle situations has stuck in my mind with her poignant stories from her own experiences as mother, grandmother, teacher, guide, and friend. She truly looks at the child from a holistic perspective, covering topics such as feeding, toys, language development, discipline, art and music, toilet learning, motor development, sensory development, connecting with nature, connecting with our child(ren), psychological development, and so much more! I especially appreciate her approach to parenting and addressing our needs/challenges as parents while trying to do the best for our child(ren). Thank you Susan for writing such an informative and encouraging book! If you haven’t heard of Susan Mayclin Stephenson before, she is AMI trained at all 3 levels (0-3, 3-6, and 6-12) and has extensively travelled. She has helped bring Montessori education to many children and families around the world. She is also an amazing oil-painter and you can check out her work as an artist and educator here. She runs the company Michael Olaf which offers a wonderful selection of children’s toys, books, furniture, and child-sized tools. The newsletters are very informative, as is the website itself! A very helpful resource on her website is the selection of video clips of Child Development Birth to Three+. Be sure to visit the website and watch some videos to be inspired! The giveaway will close on Tuesday, September 16 at 11:59PST. Winner must respond within 48 hours of being contacted. Good luck! The giveaway is now closed. Congratulations to Diara D. on winning the signed copy of The Joyful Child by Susan M. Stephenson! Disclosure statement: All opinions expressed are my own. I have not received any compensation for expressing these opinions. Susan was very generous to offer up her book for this giveaway. I don’t have a previous relationship with her although I did have the pleasure of meeting her at the 27th International Montessori Congress in Portland last summer where she signed my own copy of her book and I was privileged to hear her speak. Happy 1st Anniversary! Apron and Placemat Giveaway! Congratulations on Winning the Home Consultation! Thank you so much to all who entered to win a Home Consultation with Christie from Aid to Life Education during our first week of our 1st Anniversary Celebration! Thank you for helping to spread the word about our Montessori Moms Blog and Aid to Life Education! A huge congratulations to Kathy D! We hope you gain further knowledge and support during your Home Consultation! Both these products and the shop owners are amazing! We graciously thank Karla from Handmade Montessori and Kylie from How We Montessori Shop for offering up these wonderful products! What makes an apron Montessori? Independence! There are two different aprons to choose from: the cotton apron and the waterproof apron, costing between $16-$22 (US dollars). With the cotton apron, the child can easily slip the elastic neckband over their head and do it up using the velcro tab on the side. With the waterproof apron, the child pulls the apron over their head and slips their arms through the arm holes. Even a young toddler can independently put on and take off these aprons. 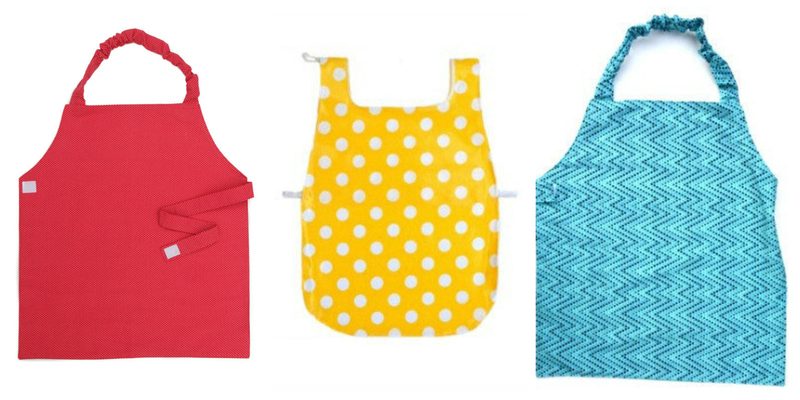 These aprons come in two sizes: toddler (fits ages 1-3) and primary (fits ages 3-6). Why Handmade Montessori? Karla is AMI certified Casa and recently A to I (Congratulations Karla!) so she has wonderful attention to detail and quality. I have been using her waterproof aprons in my classroom for years and have used the cotton apron at home with my daughter. She has excellent customer service and even better products! I can’t recommend her aprons enough! I use the waterproof aprons for water activities in my classroom, e.g. water transferring, watering plants, washing tables, etc. I think they would also be great for art activities. I use the cotton apron at home for kitchen activities e.g. food preparation and baking. Rubi’s daughter F. uses the cotton apron when painting or chalking on her easel. Not only are aprons good for protecting clothing, they also give the child a sense of purpose when doing an activity and a point of completion when the apron is removed at the end of the task. This placemat is amazing! First off, it truly is as beautiful as the photos look. The outlines are just fantastic for helping young children learn to set the table. The outlines are even better as they are raised ever so slightly. Using it multiple times a day? Not a problem, it just wipes clean! I’ve even put it to the test as my daughter, while learning to use a spoon, covered it in tomato soup. Yikes! That time it didn’t quite wipe clean but it did come completely clean! I can’t say enough wonderful things about this placemat. The placemat costs $19.95 (Australian dollars) and there is free international shipping. Kylie, the owner of How We Montessori Shop, offers excellent customer service. Every single product in her store has been used, or is currently being used by her sons. 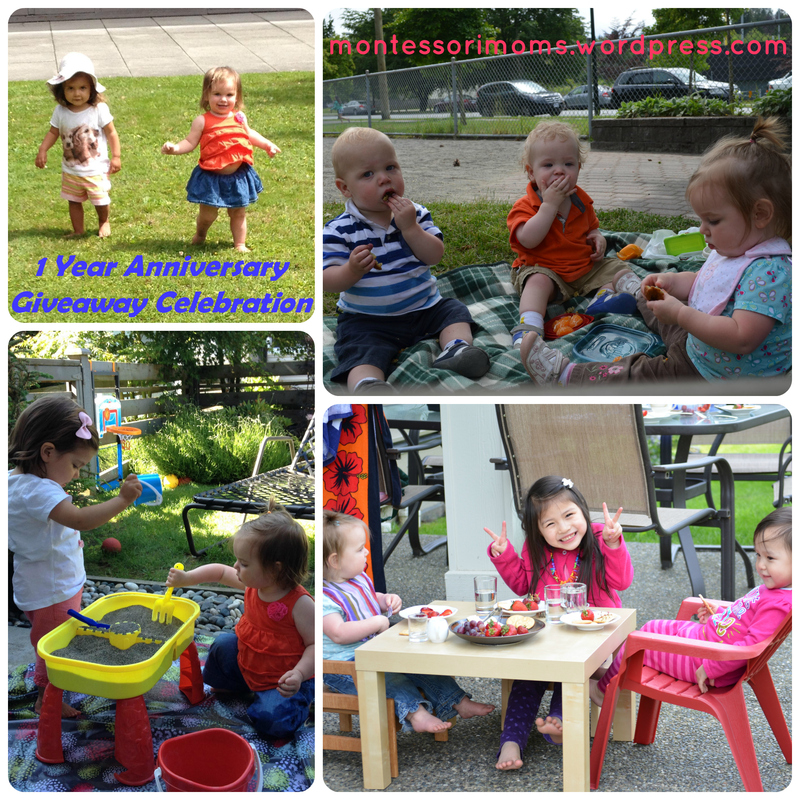 She also writes the very inspiring blog How We Montessori, and it is an excellent reference. 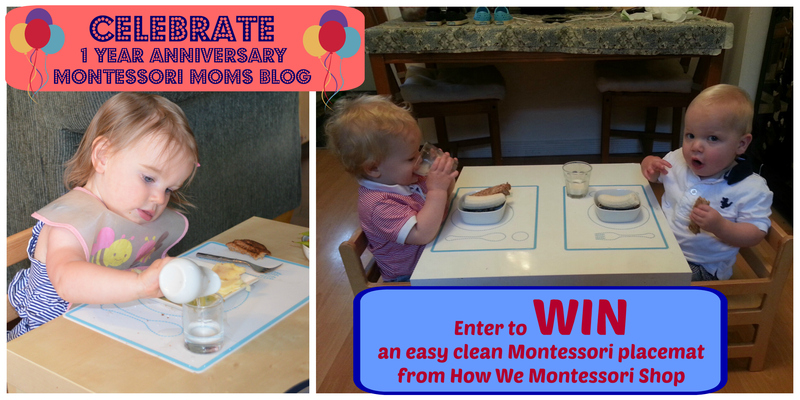 Montessori Placemat Giveaway is for one easy clean placemat from How We Montessori Shop. The giveaway is open internationally. 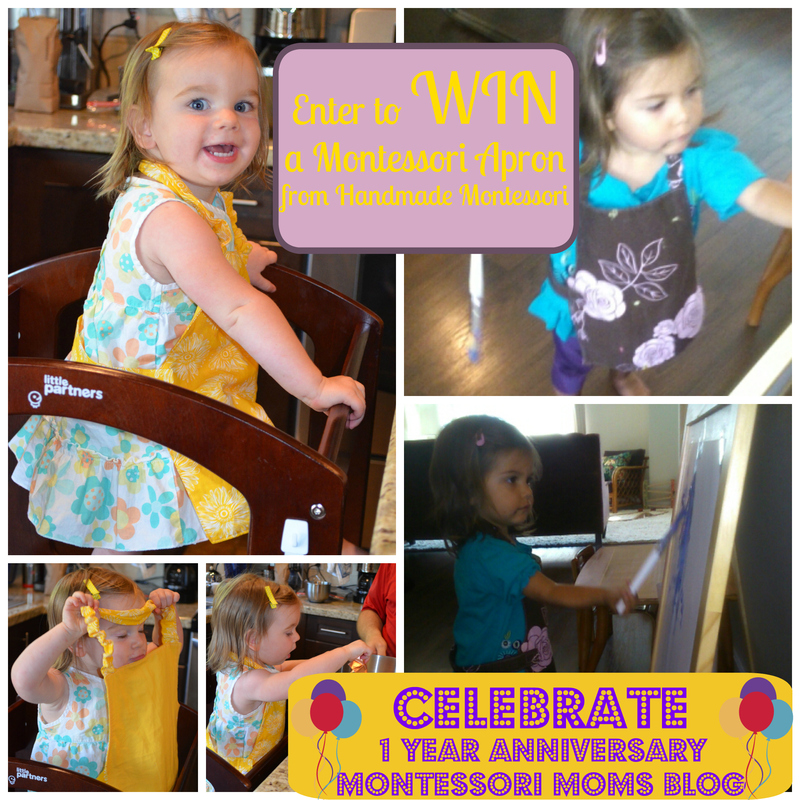 To enter leave a comment on this blog post telling us: What is your most wanted item from How We Montessori Shop? Then click the link to enter a Rafflecopter giveaway and click the green button on the Rafflecopter form telling us “I commented!” There are also lots of additional ways to enter to get your name in multiple times, such as “liking” Montessori Moms or How We Montessori Shop on facebook (if you already do “like” us, count it as a freebie!). Both giveaways will close on Monday, September 1 at 11:59PST. Winners must respond within 48 hours of being contacted. Good luck! The giveaway is now closed. Congratulations to K on winning the Montessori Apron! Congratulations to Jamie on winning the Montessori Placemat! Disclosure statement: All opinions expressed are my own. I have not received any compensation for expressing these opinions. I do have a business relationship with these shop owners so I could facilitate this giveaway. We’re so excited to have reached the 1 year anniversary of our blog! We’ve really enjoyed sharing about our lives with our children as we attempt to implement our Montessori training in our own homes. We’re amazed at how much our readership continues to grow! We hope you have enjoyed the past year of posts. One of our top posts is by Christie about setting up the bedroom for her twin boys. So to kick off the 1st Anniversary Celebration we thought we’d start with a giveaway for a Skype Home Consultation!!! Christie offers home consultations through her company, Aid to Life Education. We know you’ve enjoyed reading about how Christie has set up her home, the toys and books her sons use, and how she and her husband prepared to become parents. Wouldn’t it be great to have a 1:1 with Christie! Throughout any stage of your child’s life, Aid to Life Education is available for home consultations. Your success as a family is dependent on providing your child with the right environment at each changing developmental level. We will help to make your environment flexible and practical, looking at the specific needs of your child. We will give you tips and strategies for utilizing space and offer suggestions regarding the materials needed to better support your child’s age and ability. Just as important as the set-up of the physical environment, the adults need to have an understanding of child development and we will provide you with invaluable info on what to expect from the child at each stage. We will offer you support in parenting and how to help your child master the fundamentals. 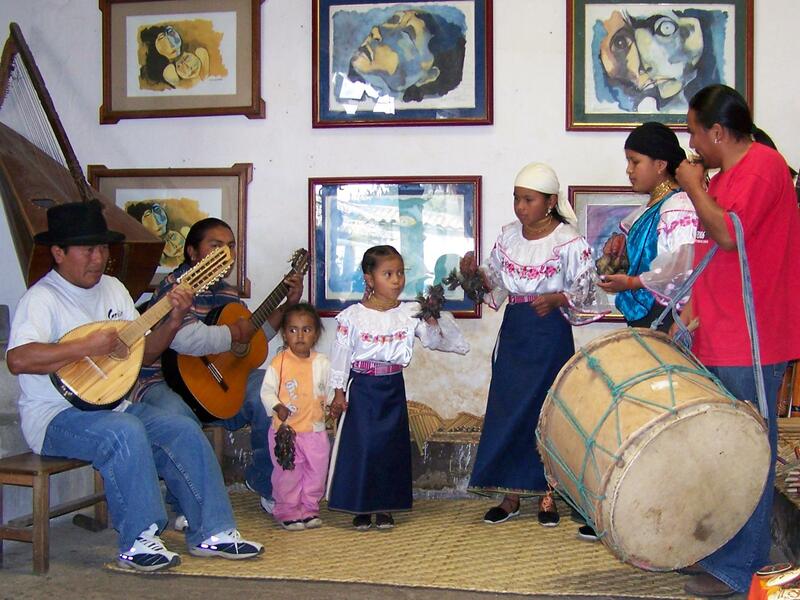 All the advice given is based on the ideals and philosophy of Maria Montessori, the purpose being to aid each child in the process of becoming a confident and independent member of society. 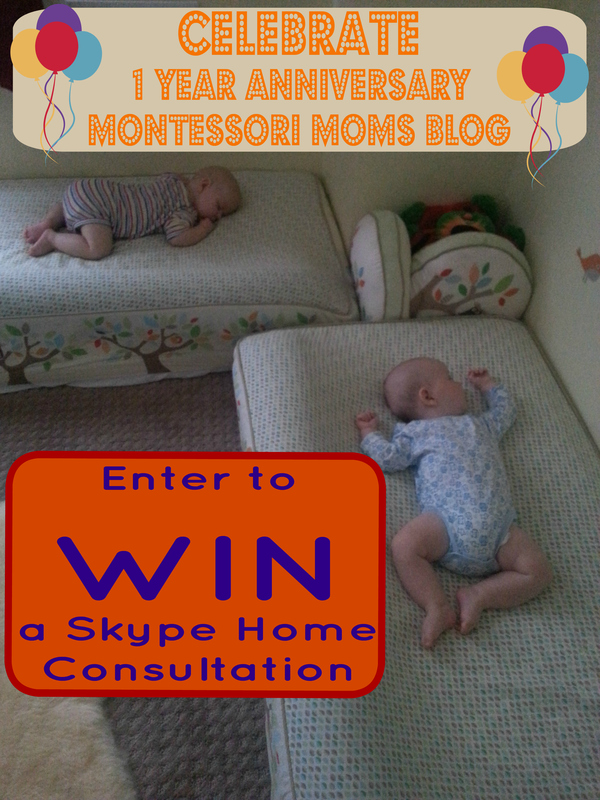 The giveaway is for a 1 Hour Skype Home Consultation from Aid to Life Education. It can be redeemed on any Sunday during the month of September (timing to be mutually agreed upon by recipient and Christie). This giveaway is open internationally. The giveaway will close on Sunday, August 24 at 11:59PST. Winner must respond within 48 hours of being contacted. Good luck! The giveaway is now closed. Congratulations to Kathy on winning the Skype Home Consultation! 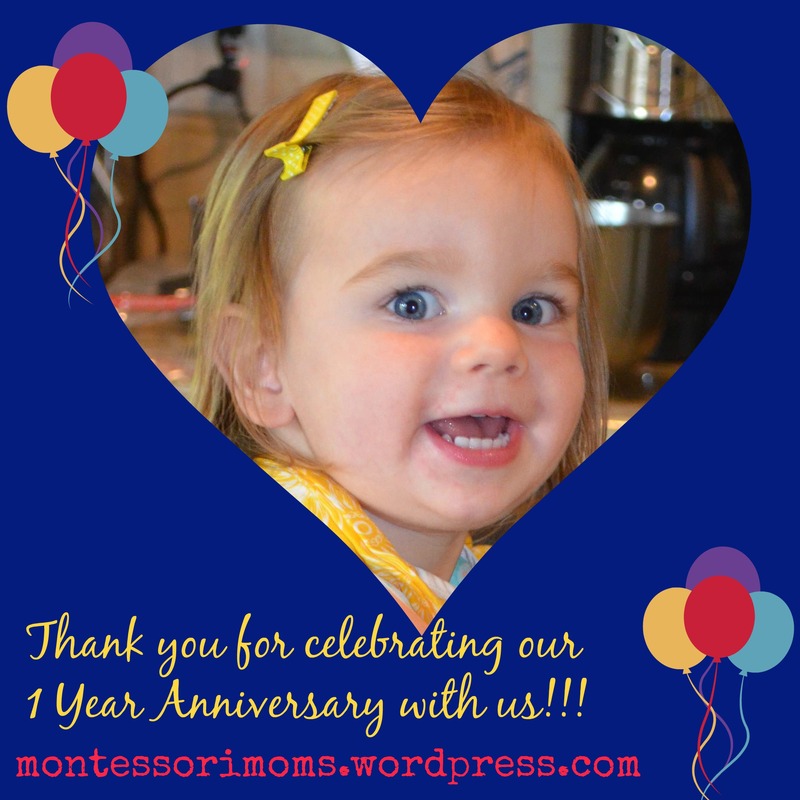 Can you believe that we’ve been blogging here at Montessori Moms for almost 1 Year! We are so thankful for all your support. We love sharing how we’re implementing our Montessori training at home with our children. We love hearing stories of how we’ve inspired you and helped you. We love hearing your stories of what you’ve learned and are now implementing in your own homes. We wanted to do something to celebrate our 1 Year Anniversary and to thank you, our readers, for your support. How about a giveaway? How about 6 giveaways? 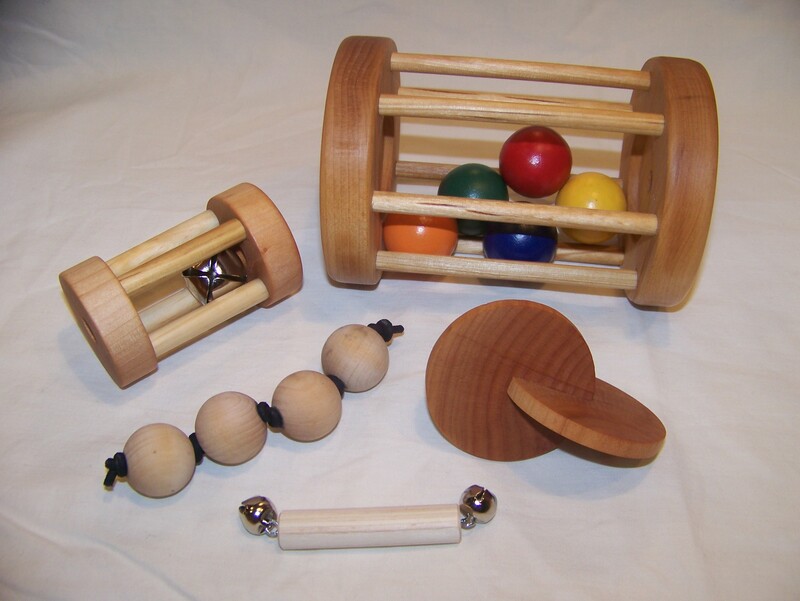 Yes – 6 different and amazing Montessori giveaways! Starting on Monday, August 18 we will have a month long anniversary celebration of giveaways. Woo Hoo!!! Each Monday for one month a different giveaway will be announced. Some weeks will have multiple giveaways. You will have one week to enter each giveaway. So make sure to mark your calendars for Monday, August 18 for the start of our 1 Year Anniversary Giveaway Celebration! Have you noticed we recently organized our blog? We hope it makes it easier for you to find information and previous posts. Let us know your thoughts! Thank you for all your support! This blog is off to a great start with 38 WordPress followers and 255 Facebook likes! With views from 50 countries! We’ve only been up and running for two weeks! Amazing! Thank you for all your comments! It was a bit overwhelming to receive so much interest and so many ideas of what you’d like to hear about. Each of you have your own situation you’re coming from but there were some definite themes such as an age by age guide, how to set up your homes, how to make materials or find them (especially on a budget), real life with the low bed, and how to incorporate the Montessori philosophy into your daily lives. We look forward to sharing our stories with you in the coming months (or years from all the comments!). Some of you had specific questions. Please ask these on our facebook page so we can get a conversation going about those topics. They were really great! Please be patient with us responding to those comments as we’re getting ready to go back to school/work. 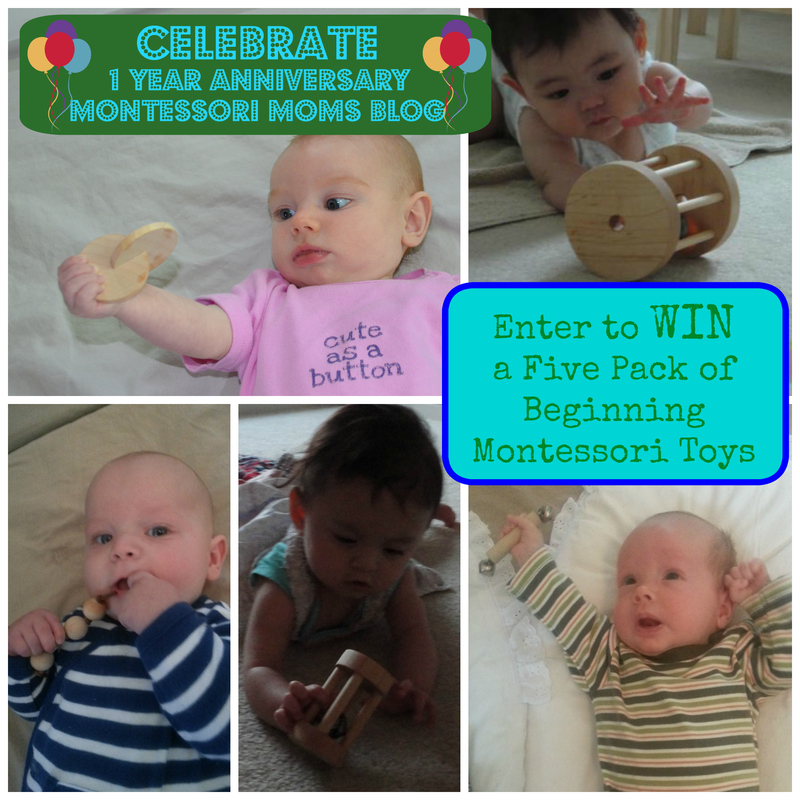 There were over 100 entries for our giveaway from Beginning Montessori for a Five Pack of Toys. The lucky winner is Kristy McCarthy! Congratulations! We hope your child or someone you pass this along to greatly enjoys the toys.